When it comes to food, there are some pairings that should never separate. I’ve heard of crustless pizzas and bunless burgers, but just can’t accept them as anything but wrong. For that reason, I was hesitant to try a Filoless Tiropita until I considered my cheese-loving friends with a gluten intolerance (stuck eating crustless pizzas and bunless burgers when gluten-free substitutes aren’t available) and thought they deserved to enjoy some of my favorite Greek cheese pie. 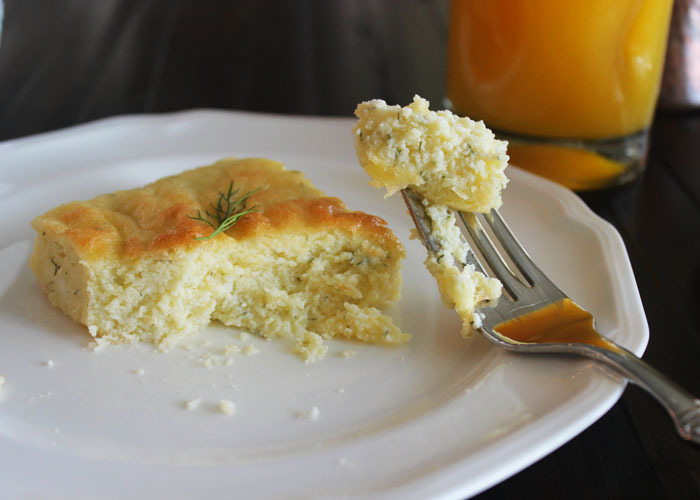 This non-traditional Tiropita is made with almond flour and has a rich feta flavor. It’s great alongside sliced tomatoes and fresh-squeezed orange juice for breakfast. If you’re not big on feta, try substituting a portion of the cheese with something milder like ricotta or cottage cheese. Tip: When substituting with almond flour in baking, bump up how much rising agent goes into your recipe as almond flour is heavier than wheat flour and can turn your cake or pie into a pancake if you don’t adjust appropriately. Preheat oven to 350 degrees. Combine all ingredients together in a bowl and pour into 13 x 9 baking dish. Bake for 30-35 minutes or until set.